TRINITY COLLEGE DUBLIN has launched an investigation after reporters from one of the university’s student newspapers planted a recording device outside a student’s on-campus apartment where an alleged society hazing event was taking place. Editors of the University Times are now facing a petition calling on them to step down over the “bugging incident” but the paper says it stands over its reporting. Last Friday, the University Times published a story about the initiation ceremony of an elite, invite-only sporting society and admitted it planted a recording device outside the apartment of the society’s president. In a statement to TheJournal.ie, Trinity College Dublin confirmed that an investigation is progressing which is being conducted by the Junior Dean. The university added that a separate investigation was also underway into the alleged hazing incident reported by the University Times (UT). Trinity takes matters such as these very seriously and absolutely condemns such practices. We are fully investigating the alleged incidents. The UT had reported that on 27 February the Knights of Campanile held an initiation ceremony on campus which started in the main square, moving on to the apartment of the all-male society’s president. Reporters who waited outside the apartment said they heard members being hazed inside. Members were allegedly being told to “bend over”, to “get in the shower” and that “it’s gonna be a long night boys”. “The reporters placed a recording device outside the apartment and proceeded to wait upstairs out of sight for over an hour and a half,” the UT reported. The device was discovered when society members left the apartment and moved to another location. UT has said that the device is still in the possession of the society and therefore any quotes used in its article are from reporters on the scene and not from the device. The paper’s editor, Eleanor O’Mahony, told TheJournal.ie that on the night in question they had not planned on using the recording device but did so because “one of our reporters had it on hand”. O’Mahony added that those involved in the report have no intention of stepping down and continue to stand over their work. “We take our work seriously. We’re happy to stand over our reporting,” she said. 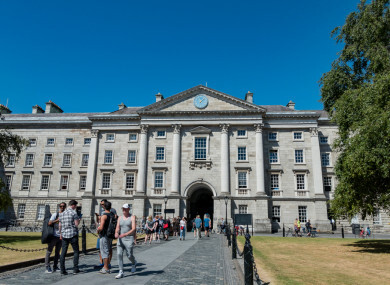 Earlier today, Trinity News reported that a petition had been launched to remove the funding for the University Times editor’s salary and accommodation from the Trinity College Dublin Students’ Union constitution. O’Mahony said that the petition was “personally very disappointing”. “The aftermath of controversy like this is not the time to make decisions about the long-term future of the paper,” she said. In a recent editorial, Trinity News - a separate college publication - called for the students involved in the story to face consequences as it claims their actions have “breached any code of journalistic ethics worth the name”. “If UT escapes this situation with no consequences, and believe, as both the current and incoming editors who wrote the story seem to, that secret recordings are acceptable news sources, then students should be worried,” Trinity News said in an editorial this week. The paper argues that the UT will be tainted if the editors remain in their positions. Its integrity has been destroyed. It can only be restored if those responsible apologies for their actions, step down, and allow the culture of the paper to change. The Knights of Campanile told TheJournal.ie that it would not make an official comment on the incident until the investigation by TCD is complete. Email “Trinity launches investigations after furore over alleged 'bugging' of secret society 'hazing'”. Feedback on “Trinity launches investigations after furore over alleged 'bugging' of secret society 'hazing'”.